Corsets and Crinolines is a study of the changing shapes of women's dress and how these were produced, how simple laced bodices became corsets of cane, whale-bone and steel, while padding at shoulders and hips gave way to the structures of farthingales, hoops and bustles. Added are contemporary tailors and dressmakers accounts, illustrations, index, a glossary of terms and materials, appendices on the repair and manufacture of corsets and crinolines. References to Whale-boned Bodies and Farthingales from Contemporary Sources. References to Stays and Hoop Petticoats from Contemporary Sources. The Crinoline and the Bustle. The Corset, Crinoline,and Bustle—from Contemporary Magazines. References to Corsets,Crinolines, and Bustles from Contemporary Sources. 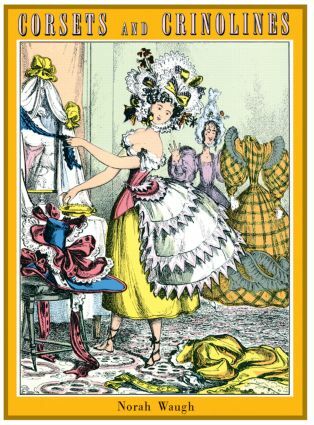 THE CONSTRUCTION OF FARTHINGALES, HOOP PETTICOATS, ETC. SUPPORTS FOR CORSETS, CRINOLINES, ETC.